Check this out! Colors done by the wonderful . Check out her gallery! She's got mad skills on those colors! ...beautiful, even. I can type, I swear! Excellent work by both of you! Thank you! We make a great team! Absolutely! I'd love to work with either (or both) of you some time! Oh yeah, very nice! 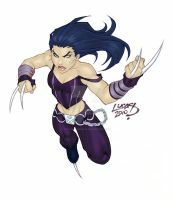 The colours really enchance the linework in this one; she did a great job of creating some additional muscle definition and snazzy effects. 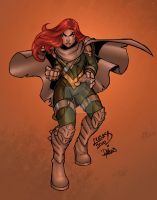 Really like the flow of the hair and cape in this piece; Siryn has never looked better! Wow, you two need to work together a LOT more, this is fantastic! Totally agree! I'm sure this is not going to be the last time you'll see something from both of us. Wow outstanding! I actually prefer her with the condename 'Banshee' Its a nice way on someone actually honouring their parents. She did one heck of a good job =0 ! Yeah she did a great job!